Our series on the native trees of the Chicago area is back this week with an in depth look at locust trees. Locust trees are found throughout North America and Asia and they are classified under one of two different genera; the genus Gleditsia and the genus Robinia. There are twelve known species of locust trees under the genus Gleditsia including the popular honey locust, and there are ten known species under the genus Robinia, including the native but somewhat invasive black locust. The honey locust and the black locust are the most common types of locust trees and they are the two species that are native to the Chicago area. Locust trees are resilient, deciduous trees that are part of the pea family of plants. Their identifying characteristics include thorns on the trunk and lower branches, early blooming white flowers that grow in clusters, and reddish-brown pea pods. These trees can adapt to about any location including landscapes and the side of a road. 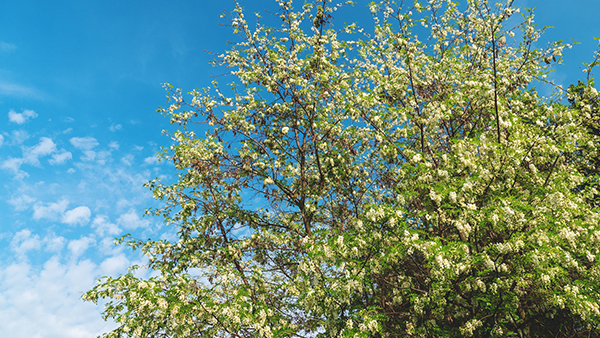 If you are considering planting a locust tree on your property however, you must take careful consideration if it is a honey locust and avoid planting black locust trees altogether. In this article, we will further explore locust trees, mainly the honey locust and black locust, including their common characteristics, natural threats, and care tips. If there is a locust tree on your property, it is important to provide it with proper care to avoid problems with insects and disease and allow it to grow to its full potential. Our arborists at Hendricksen Tree Care are passionate about caring for the trees in the Chicago area and we provide full tree care services that include tree trimming, fertilization, and disease and insect treatment to keep locust trees healthy. Our arborists are ISA certified and equipped to provide effective care for all types of Chicago trees. 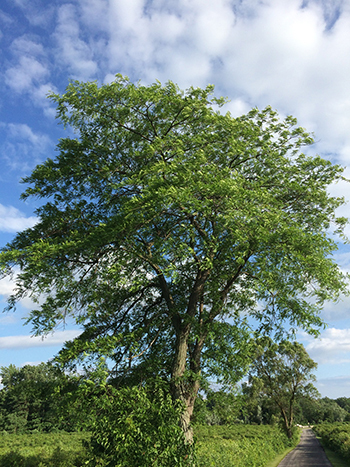 Locust trees have several defining characteristics that make them easy to identify. These characteristics include their clusters of flowers that bloom in the spring and give off a strong fragrance, and their pea pods that contain seeds. Most types of locust trees are tall, growing between 30 and 70 feet, and they have colorful fall foliage. Height: In general, honey locust trees can be between 30 and 70 feet tall and 30 to 70 feet wide while black locusts can grow between 30 and 50 feet tall and 20 to 35 feet wide. Old locust trees in the wild may be much taller. 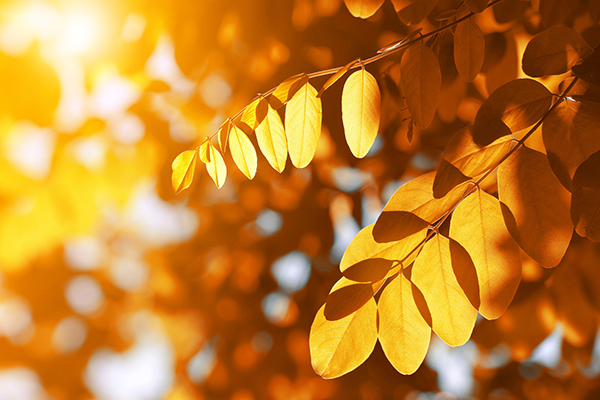 Leaves: The leaves of both the honey locust and black locust trees grow in a pinnately compound pattern and they are small and oval shaped. They are green during the spring and turn yellow in the fall. Flowers: The flowers of honey locusts and black locusts are small and they grow in drooping clusters. The honey locust tends to have greenish white flowers while the flowers of the black locust are white but could also be pink or purple. These flowers are not very showy, but they are quite fragrant. Fruit: The fruit produced by all locust trees are seeds that are contained within a pea pod. The pea pods of honey locusts are 6 to 8 inches in length while the pea pods of a black locust are 2 to 4 inches in length. The pulp within the pea pods of a honey locust is edible while the pulp in pea pods on the black locust is toxic. Thorns: The honey locust and black locust each have thorns, but the location and size of the thorns is different between trees. Thorns on the black locust are small and appear at the base of the leaves. The thorns of a honey locust are 1 to 4 inches long and can be fund on the branches as well as the base of the leaves. It is also common for thorns on honey locusts to appear in dense clusters. Bark: The bark of a honey locust starts out reddish brown and matures into a grayish brown color. The honey locust may have long, raised strip in the bark as well as clusters of thorns. The bark of a black locust has deep ridges and furrows and it is dark gray in color. The Springtime flowers of the Locust Tree are not particularly showy, but they are very fragant! As mentioned above, locust trees fall under two genera, the genus Gleditsia and the genus Robinia which are very similar but differ in a couple of key ways. The main difference between these genera is that the pulp and leaves produced by the Gleditsia are edible for wildlife while the branches, leaves, and fruit of the Robinia are toxic for animals and humans. There are twelve species of Gleditsia and ten species of Robinia locust trees, but for our purposes we will focus on the honey locust and black locust trees which are great examples of each and the only examples of native Illinois locust trees. Honey Locust: Honey locust trees (Gleditsia triacanthos) are fast growing trees that can live up to 150 years. Their thorn clusters and large pea pods make them easy to identify. Grazing animals such as cows and horses help spread honey locust seeds by eating them and dispersing them in their droppings. The digestive process breaks down the coat of the seed which makes it easier to develop. The honey locust gets its name from the sweet taste of the pulp in its pea pods. Black Locust: Black locust trees (Robinia pseudoacacia), also known locally as “Chicago blues,” is a fast-growing tree that does not get quite as tall as the honey locust. These trees have more deeply furrowed bark, branches that grow in zig zag patterns, and smaller thorns at the base of the branches. The pea pods on black locusts are smaller than those of the honey locust and they are toxic. Even though black locusts are native to the United States, including the Chicago area, they are considered invasive because they take over natural habitats. These trees have the ability to displace grass and turn a grassland into a forested area. Residents of Illinois are advised against planting black locust trees. Locust Borer: The locust borer is an insect that mainly attacks black locust trees by laying their eggs on locust trees in the fall. When the eggs hatch, the larvae of the locust borer tunnels into the tree where it hibernates for the winter. The next spring, the larvae burrow deeper into the sap wood to feed and by the middle of the summer, they will mature and push their way out of the bark. 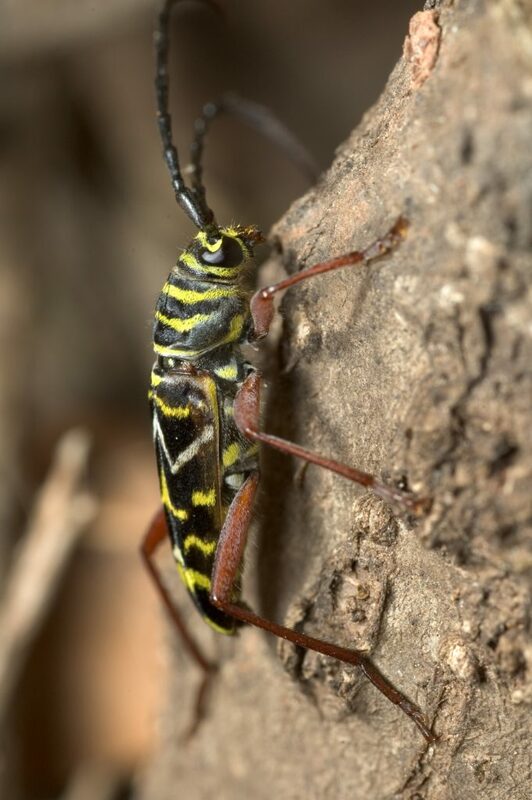 The larvae of the locust borer are cream colored with segmented bodies and the adults are long-horned beetles that are black with yellow stripes. The tunnels they create can weaken the tree, making it susceptible to wind damage and twig and branch die back. Honey Locust Plant Bug: As its name suggests, the honey locust plant bug attacks honey locust trees. These bugs are green in color and the young nymphs look like a smaller version of the adults. Honey locust plant bugs hatch in the early spring and spend the first half of the growing season feeding on new foliage as they develop into adults. By late July, the fully matured honey locust plant bugs lay their eggs under the bark and disappear. These bugs can cause damage to the leaves such as leaf distortion and yellow or brown spots, and they can even cause the tree to lose its leaves prematurely. While these bugs cause stress for the honey locust tree, they will not kill the tree. Sometimes changes in weather conditions can cause these bugs to disappear. Locust Leafminer: The locust leafminer is another insect that attacks black locust trees. These bugs are flat beetles as adults that are black in color with reddish orange lines on either side of their bodies, and their larvae have white segmented bodies and dark orange heads. The problem starts when adults that have spent the winter in the crevices of the bark emerge in the spring and lay eggs. The larvae feed on the interior of the leaves when they hatch and emerge as adults to feed on the leaves from the outside, resulting in skeletonization. The adults will then overwinter in the bark crevices and begin the cycle again the following spring. Leaves affected by these bugs may have brownish spots or become skeletonized. Black locust trees can typically survive these infestations, but they will affect the aesthetic appeal of the tree. Wetwood: Wetwood is a bacterial disease that causes the wood of a locust tree to turn yellowish brown in color and excrete a slimy substance. 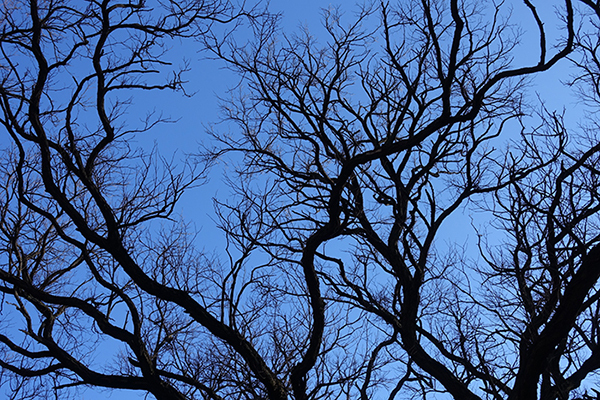 Locust trees affected by this disease may also experience cracked wood during the winter. Wetwood can seriously weaken the tree warping and cracking the trunk and branches. If a locust tree is affected by wetwood, it most likely needs to be removed. Verticillium Wilt: This disease is caused by a fungus that comes in through the root system and attacks the branches and leaves. Affected trees may experience wilting branches and leaves, with the leaves turning shades of red or yellow as they wilt. Verticillium wilt can quickly kill trees which is why immediate action is recommended as soon as you notice the signs. Leaf Spot: Leaf spot can be caused by a variety of different fungi or bacteria and it results in spots on the leaves that are tan, brown, or black in color. Excess moisture can make leaf spot more widespread once it has started. Fortunately, this disease does not kill locust trees, though trees with extreme cases may need to be removed. Cankers: Cankers are dead areas of wood that are killed by bacteria or a fungus. The affected wood becomes decayed which can severely weaken the tree, making it susceptible to further damage from wind and storms. Trees that are heavily affected by cankers will need to be removed. Effective watering and fertilization can help locust trees resist cankers. 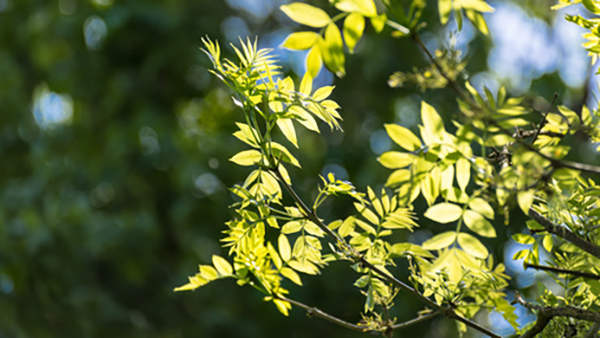 Planting: Locust trees are pretty tolerant of most soil conditions so they can be planted just about anywhere, as long as they get plenty of sunlight. Planting them in areas where nothing else has survived is best because these trees are more likely to survive than other plant life. Honey locust trees should be planted early in the spring. Remember, planting black locust trees is not recommended. Watering: Honey locust trees do not need much water as they are highly tolerant of drained soil and drought-like conditions. They must be watered weekly for their first year of growth and the watering should be done slowly over one hour so that the water trickles gradually into the root system. Mulching: Cover the root system of your honey locust trees with 2 inches of organic mulch. This will help retain nutrients for the roots and protect them from insects and disease. Adding sifted compost to the mulch each year will help its effectiveness. Fertilization: Honey locust trees do not need much fertilization unless they are in soil lacking in nutrients. New trees should be fertilized with granular fertilizer once per year either after the leaves have fallen in the fall, or before the leaves have budded in the spring. Pruning: Pruning should be done for honey locust trees when they are young to remove dead or damage branches and prevent the spread of cankers. 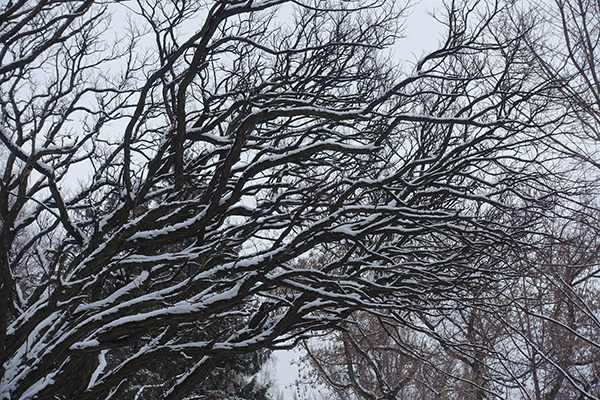 This should be done in the spring or the fall, older locust trees may need little to no pruning. If you do not want to prune your locust trees yourself, you can call a professional to provide tree trimming services. 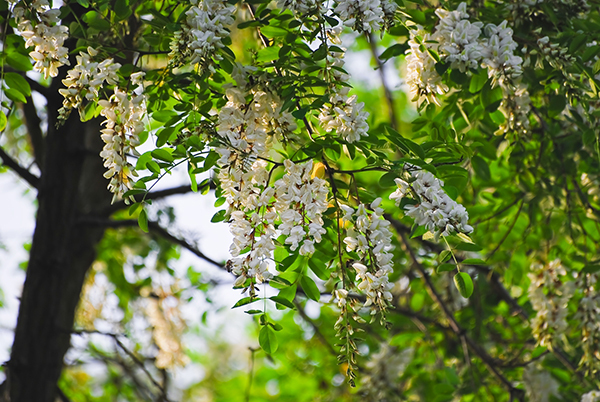 Honey locust trees and black locust trees are among the most resilient tree species in the Chicago area as they can withstand dry, harsh soil conditions and survive many diseases and insect infestations. However, it is still recommended to take proper care of these trees to prevent any issues with insects or disease that could lead to the tree’s removal or problems for other trees on your property. Our arborists at Hendricksen Tree Care can provide complete commercial and residential tree care services for locust trees in the Chicago area including tree treatment and maintenance, fertilization, and tree pruning. Our arborists are highly trained and we use ISA approved treatments to help your trees stay healthy and fight insects and disease. We can accurately diagnose any issues with your trees and provide effective care to get them back to health. You can contact Hendricksen Tree Care for tree care services in the north and northwest Chicago suburbs including Arlington Heights, Palatine, Winnetka, Wilmette, Highland Park, and Mount Prospect, IL. Watch out for the next edition of our series about the native trees of Chicago.